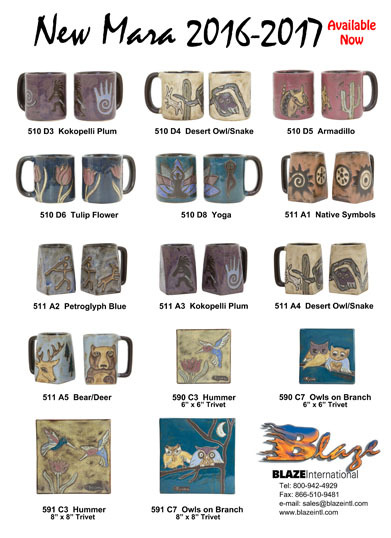 Padilla designs unique Mugs, Mug Trees and accessories which are available in a wide variety of orignal glazes and styles. Blaze International was established in 1986 and is located in San Diego, California. We specialize in the importation and wholesale distribution of high quality ceramic stoneware mugs, dinnerware and accessories. We work with artisans to develop unique, high quality popular functional art that can be shared, collected and used every day. Blaze International welcomes input from retailers, artists, and consumers. Please feel free to drop us a line or give us a jingle. Our normal business hours are weekdays, from 8:30am to 4:30pm (PST).